NEW YORK CITY (April 3, 2019) — One of the 154-pound division’s biggest punchers — Dominican sensation Carlos “El Caballo Bronco” Adames — is set to make a thunderous statement April 20 at Madison Square Garden. NABF champion Adames will defend his belt against Brooklyn native Frank Galarza in the 10-round featured bout on the Terence Crawford vs. Amir Khan undercard broadcast, which will begin at 6 p.m. ET/3 p.m. PT on ESPN2 and in Spanish on the ESPN app. Adames vs. Galarza will also be contested for the vacant NABO 154-pound belt. 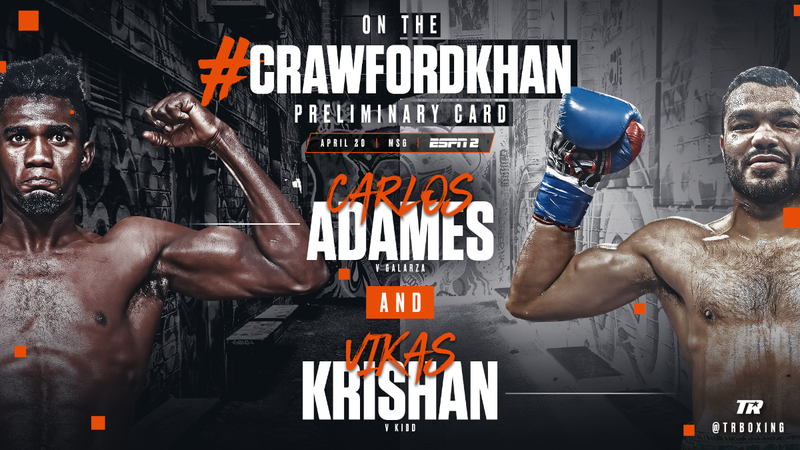 Adames vs. Galarza will headline a scheduled five-fight broadcast, which will lead into the Crawford vs. Khan pay-per-view extravaganza at 9 p.m. ET/ 6 p.m. PT. Details on how fans will be able to access the pay-per-view event will be announced at a later date. Adames (16-0, 13 KOs) is 3-0 since signing with Top Rank in early 2018. He turned pro in 2015 after a nearly 300-fight amateur career and showed he belonged at the world-class level in July 2017, knocking down and scoring a shutout decision over former world champion Carlos Molina. His last two fights have lasted a total of five rounds, and he is coming off a third-round knockout over Juan Ruiz on Jan. 18 in Verona, N.Y.
Galarza (20-2-2, 12 KOs), from the Red Hook section of Brooklyn, overcame a troubled childhood and a brief 11-fight amateur career to become a longtime contender in the paid ranks. He began his career 17-0-2 before a sixth-round TKO loss to Jarrett Hurd, who is currently the unified 154-pound world champion. A close decision loss to Ishe Smith followed in September 2016, but Galarza has since resurrected his career, winning a trio of fights to set up this opportunity versus Adames. Former Indian amateur standout Vikas “The Indian Tank” Krishan (1-0, 1 KO) will take the next step in his professional journey against Noah Kidd (3-1-1, 2 KOs) in a six-round super welterweight fight. Krishan was a two-time Olympian for his home country and is the only Indian fighter to have won both the Asian and Commonwealth Games. Puerto Rican middleweight sensation Edgar Berlanga (9-0, 9 KOs) has scored nine consecutive first-round stoppages to begin his pro career. He will look to make it 10 for 10 versus Brazilian veteran Samir Dos Santos (37-15-3, 26 KOs) in an eight-rounder. The Brooklyn-born Berlanga has fought four times in New York City as a pro and will be making his Top Rank debut. Bantamweight prospect Lawrence “BT” Newton (11-0, 7 KOs), a stablemate of Crawford’s, will face Jonathan Garza (7-2, 2 KOs), in a six-round showdown. Larry Fryers (9-1, 3 KOs), a native of Ireland who now lives in New York, will look to make it four wins in a row against Dakota Polley (5-2, 2 KOs) in a super lightweight bout scheduled for six or four rounds. Promoted by Top Rank, in association with Matchroom Boxing and Khan Promotions, tickets priced at $606, $406, $306, $206, $106, $81, and $56 (including facility fees) are on sale now and can be purchased at the Madison Square Garden Box Office, all Ticketmaster outlets, Ticketmaster charge by phone (866-858-0008) and online at www.ticketmaster.com or www.MSG.com.